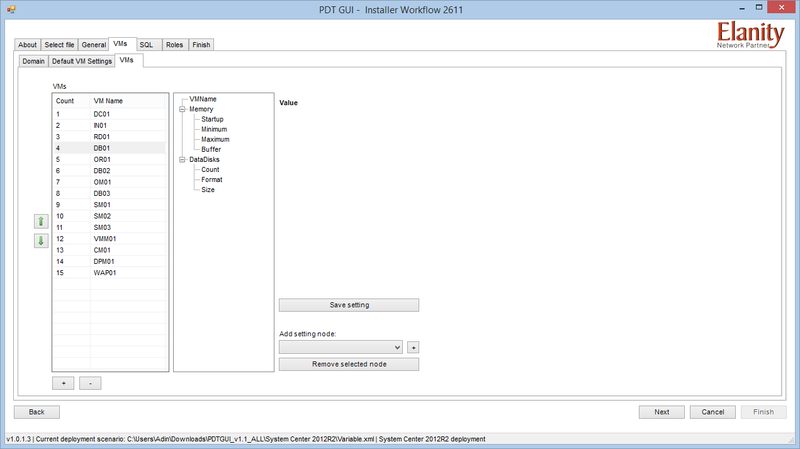 In our last post, we used the PDT’s VMCreator.ps1 script to create all the VMs that are required to setup all System Center components. Now, we are going to use the Installer.ps1 script to finish the installation. 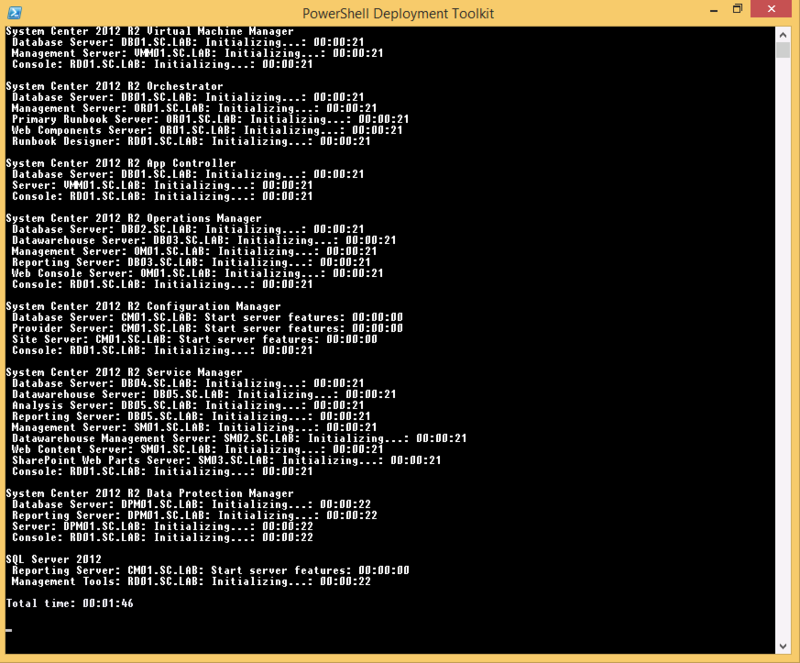 Start by running PowerShell command prompt as Administrator. 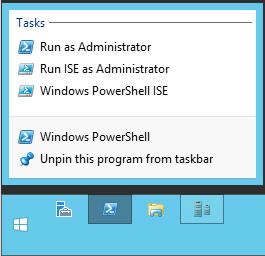 Right-click on PowerShell and choose ‘Run As Administrator’. 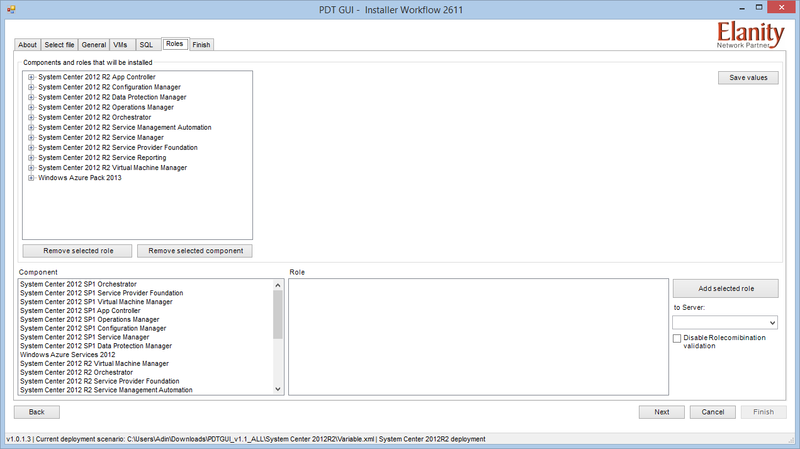 In the PowerShell command prompt, change the working directory to where the Installer.ps1 script is located (in my example, in the Downloads folder); for example: cd “C:\Users\Adin\Downloads”. Before running the script to execute the installation, it is best to run the validation option first, to ensure everything is in place. To do this, run the Installer.ps1 script with the “-ValidateOnly” parameter, like this: PS C:\Users\Administrator\Downloads\PDT2.5.2509> .\Installer.ps1 -ValidateOnly. This will initiate the validation, which checks things like the VMs, dependencies, SQL Server installations, and media for installation. As you can see in my lab example, the Media validation has failed. 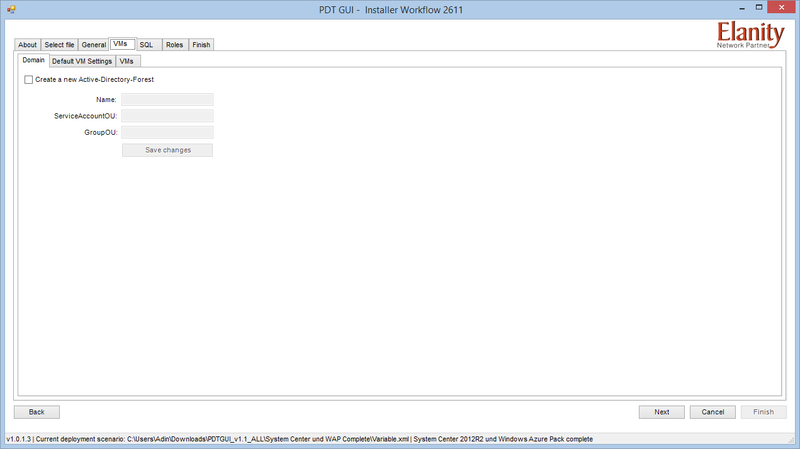 You will notice that the Installer.ps1 script is looking for the media in the C:\Temp directory. But wait, didn’t we download all of the required files by running the Donwloader.ps1 script? Yes we did. Then why is this validation failing? These lines tell the scripts where path to the source files are, and where (originally) to download those files. So at this point, we have 2 choices. Either we can move all of the files into C:\Temp, or we can change the “SourcePath” directory to match where the files are downloaded to (namely C:\Installer\Prerequisites). In my case, I’ll just move the files. But if you want, you could modify the SourcePath variable. Re-run the Installer.ps1 script with the “-ValidateOnly” parameter. The validation for the Media should pass now. However, as you can see in my lab example, I am now getting validation failures on the Service Accounts. So, how do we fix this? Well, first, I should mention that I am running the PowerShell scripts on my HOST machine; which is NOT a part of the domain. This is why the validation of the Service Accounts fails. So you have 2 choices, either join your HOST to the domain, or copy the Installer.ps1 script and C:\Installer directory to the Domain Controller. 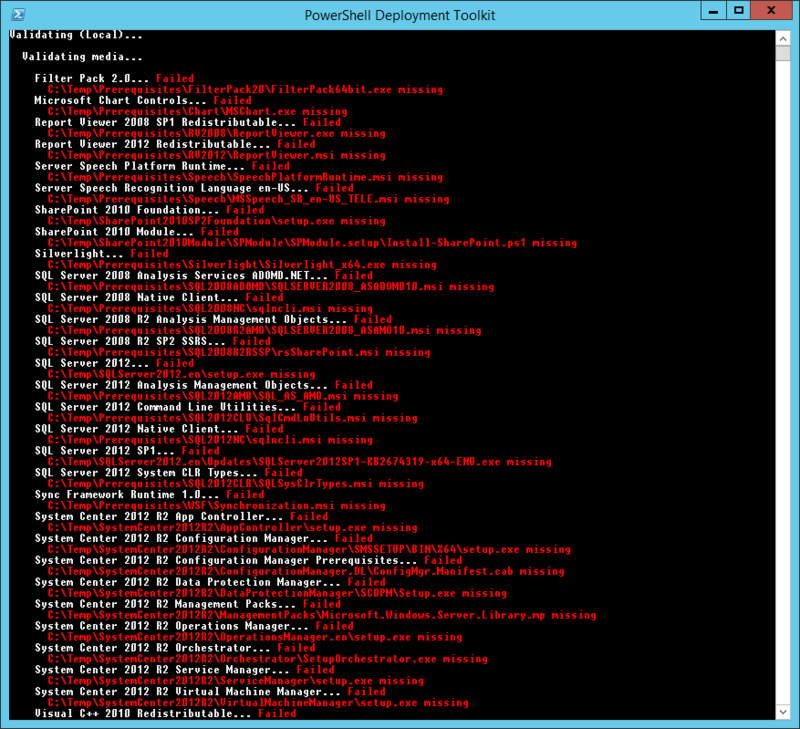 Since I like to re-build my lab over and over, I don’t prefer to add my HOST to the domain. So, in my lab example I opted to copy the files to my Domain Controller VM, and re-run the Installer.ps1 script with the “-ValidateOnly” parameter. 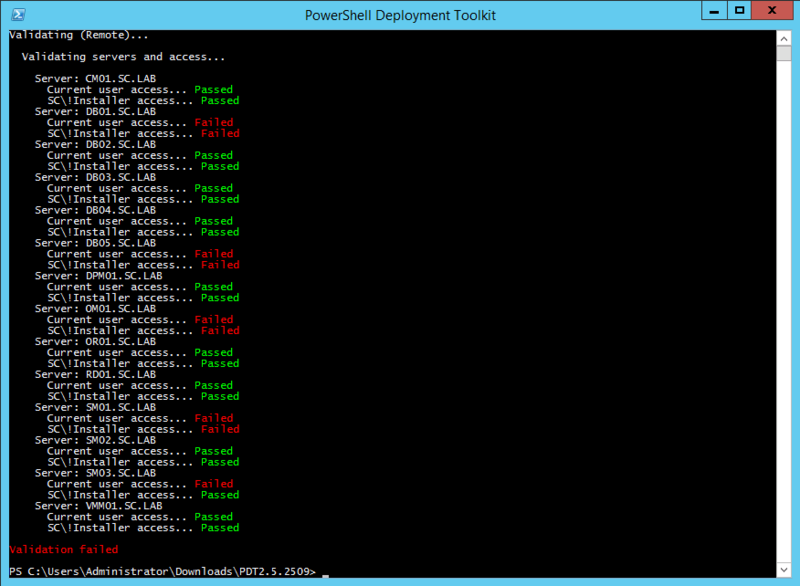 Now, when I did this, I am STILL getting validation errors, but this time with the Server and Access validation. Why is this? Honestly, I don’t know. But I do recall reading/hearing somewhere about possibly having to run these scripts from an Administrator’s workstation, and NOT from any of the systems that the scripts are designed to work with. Since I was originally running the scripts on my HOST system that was NOT connected to the domain, that was one issue. 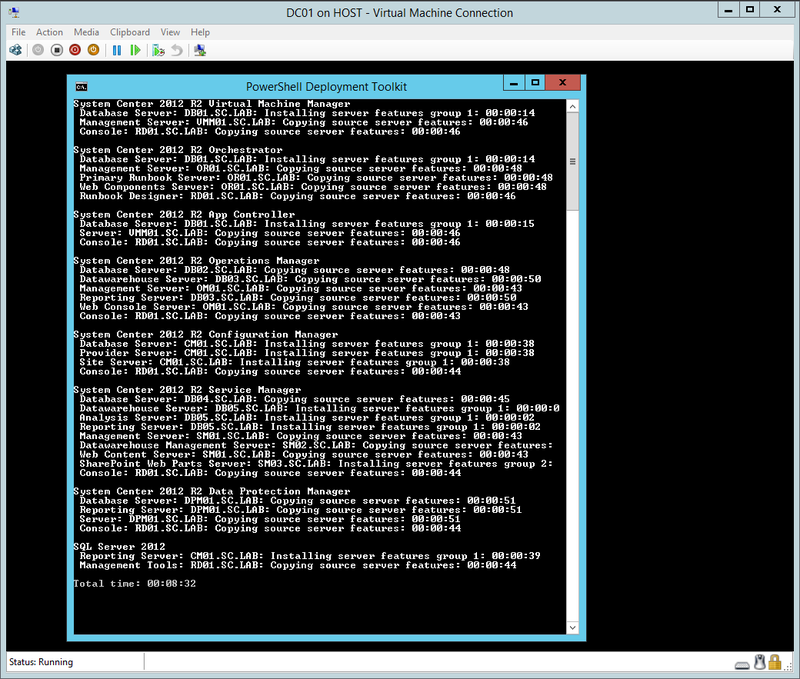 Then I ran the scripts from the Domain Controller, which resolved the Account validation. So, I thought that I would try one last thing. I decided to create an Administrator workstation and run the scripts from there. Now, of course I ran the Installer.ps1 script with the “-ValidateOnly” parameter just to see if everything passed prior to actually running the script to perform the installation. And guess what! Everything passed! So, now that we know everything is green and we won’t end up with a partial/incomplete installation, we are now ready to run the Installer.ps1 script, and complete the final part of our installation. Run the Installer.ps1 script, and the validation will be completed again (as designed), then the installation will be initiated. Just like the VMMCreator.ps1 script, the display will turn green when each item is completed. Eventually, it will complete all pieces. 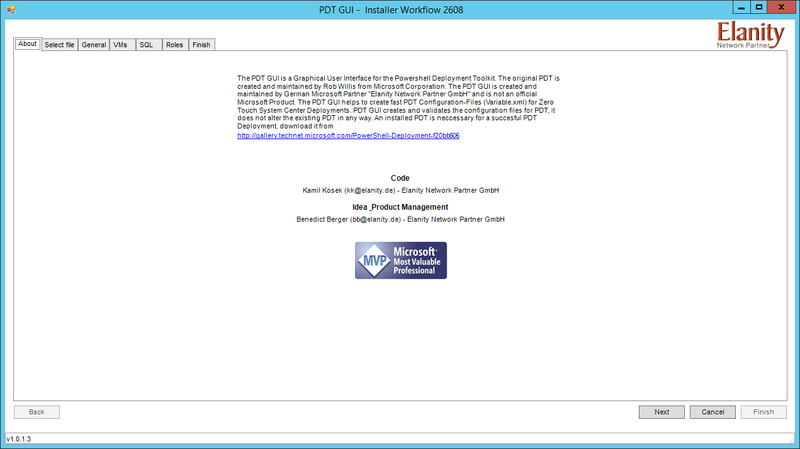 Congratulations, you have now successfully used the PowerShell Deployment Toolkit (PDT) to automatically install and configure an entire System Center environment! One final note. You may not have noticed, but all of the System Center consoles were actually installed onto server RD01. Why is that? It’s not the Administrator’s workstation. The answer is because that server is the System Center Orchestrator Runbook Designer server, which requires all of the consoles for the interoperability/connectivity to create runbooks, and thus System Center automation. 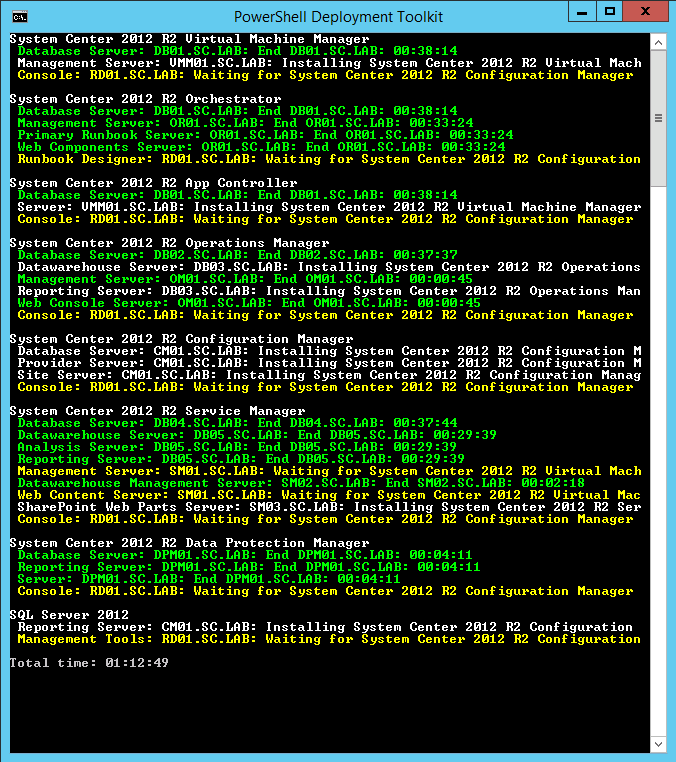 So, if you are looking for the console for a specific System Center component (i.e. SCOM, SCCM, etc. ), you will need to log into the RD01 server and launch it from there. Alternatively, since we had to setup an Administrator workstation, you could install each console on the workstation as well. 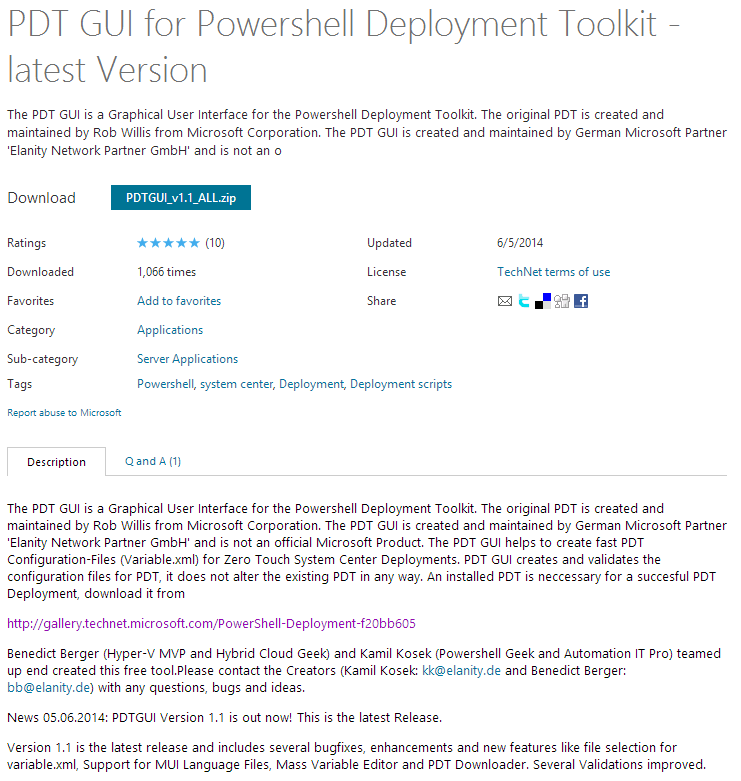 I hope this post series on the PowerShell Deployment Toolkit has been helpful. Happy lab-ing. 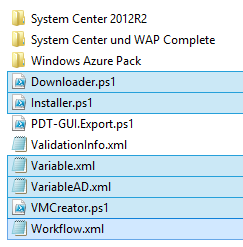 In our last post, we used the PDT’s Downloader.ps1 script to download all the files, pre-requisites, etc. that are required to setup all System Center components. Now, we are going to use the VMCreator.ps1 script to create all the VMs we need. 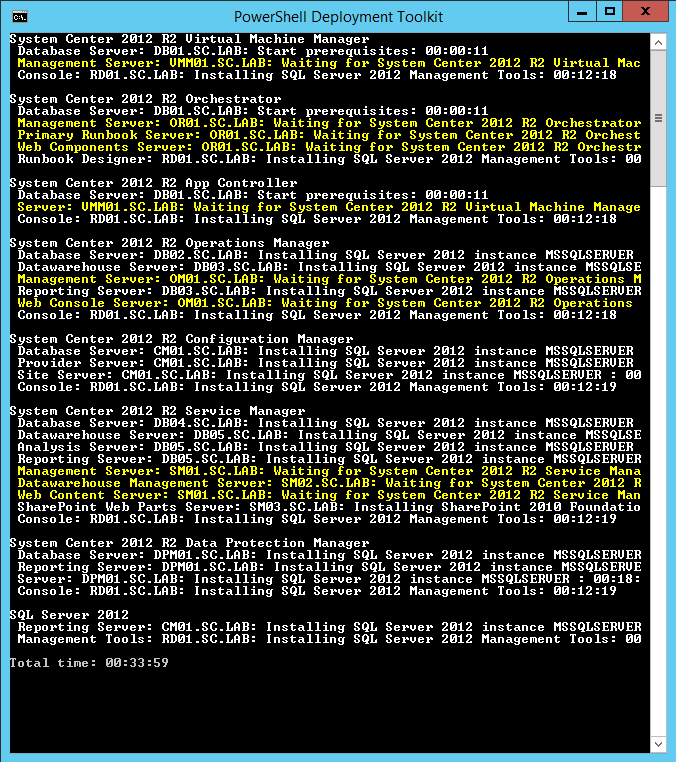 IMPORTANT: This script only support creating of VM’s on Microsoft Windows Server Hyper-V. 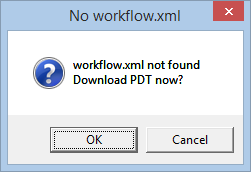 The PDT2.5.2509 directory contains 2 important files, called Variable.xml, and VariableAD.xml. This is the file that tells the script what to label the VMs, etc. NOTE: The file “Variable.xml” will create all VMs created for System Center, but requires the existing of Active Directory first. 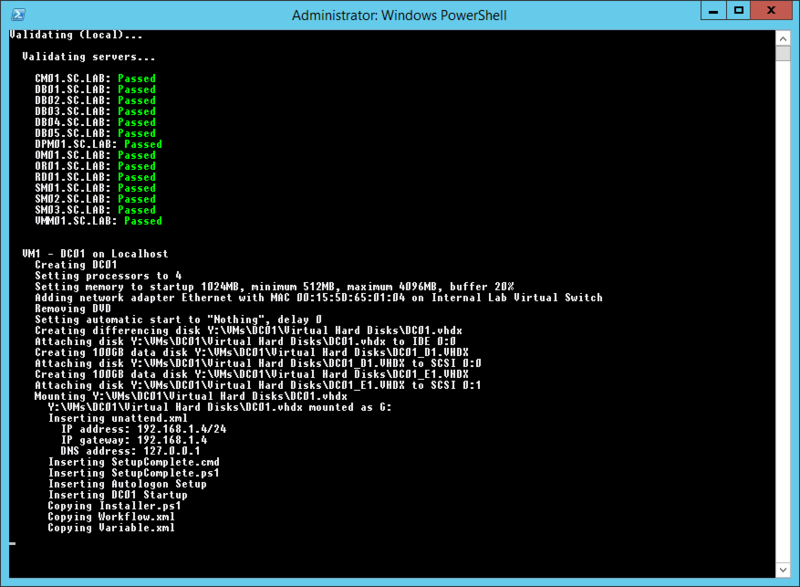 The file “VariableAD.xml” will create all the VMs including a Domain Controller with Active Directory. This is the best option to use if you want to re-build your lab environment completely automated. This is the file that I will be using. Let’s first take a look at this file, so that I can point out the area(s) you may want to customize. Start by editing the VariableAD.xml file. First, you should take note that the domain used is “CONTOSO”. If you want to customize your setup to have a specific domain name, you will need to Find and Replace all entries of “CONTOSO” with your domain. In my lab example, I am going to change it to “SC.LAB”. However, there are 2 different types of entries that contain the word “CONTOSO”. 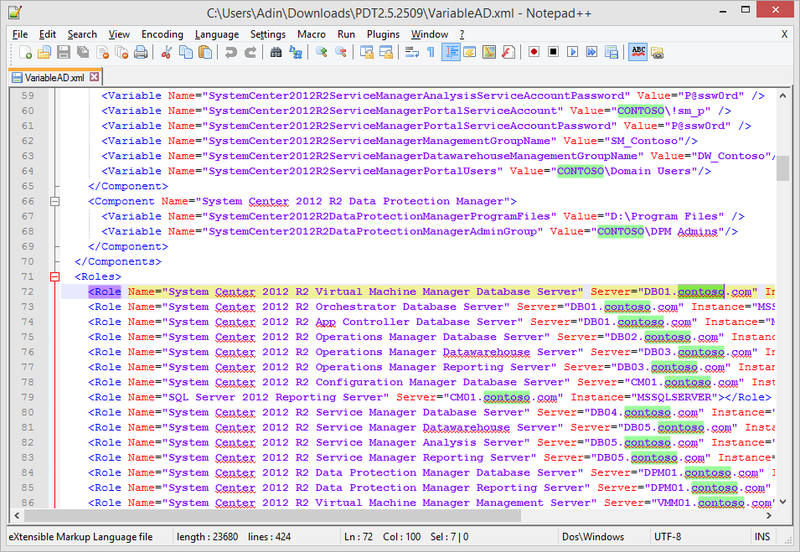 One for Service Accounts, using the ‘Domain\UserName’ pattern (44 entries), and another that uses ‘Domain.com’ (46 entries) for the database server references. Therefore, to make it easier to use Find and Replace, I have found that replacing the ‘Domain.com’ references first is best. In my case I will use Find and Replace and replace the existing “Contoso.com” with “SC.LAB”. If your domain uses the “.com” ending, then you can just simply replace all entries of “CONTOSO” with your domain name. Once you have the domain modified, save the file as “Variable.xml” replacing the existing one, or you can name it something specific like “VariableADCustom.xml”. Now that we have a customized Variable.xml file, we are ready to make a few minor modifications to the VMCreator script and then run it. If you have re-named the Variable.xml to something different, you will need to edit the VMCreator script first (because by default it looks for Variable.xml). I have not attempted this yet, so re-name your XML file to be “Variable.xml”. Once I have attempted with a re-named file, I will post an update to this section. Now, before we can run the VMCreator script, we need to create a sysprep’d VHD file for each OS required (namely Windows Server 2008 R2, and Windows Server 2012 R2). To make this easy, you can use the Convert-WindowsImage.ps1 script (found here: http://gallery.technet.microsoft.com/scriptcenter/Convert-WindowsImageps1-0fe23a8f). 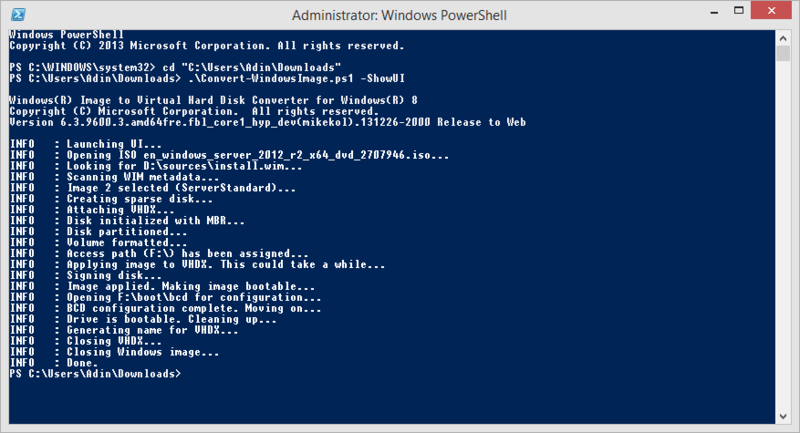 Using this command-line tool allows you to rapidly create sysprepped VHDX and VHDX images from setup media for Windows 7/Server 2008 R2, Windows 8/8.1/Server 2012/R2. This script actually has a GUI to make it easier to work with, which I will walk though here. In the PowerShell command prompt, change the working directory to where the Convert-WindowsImage script is located (in my example, in the Downloads folder); for example: cd “C:\Users\Adin\Downloads”. 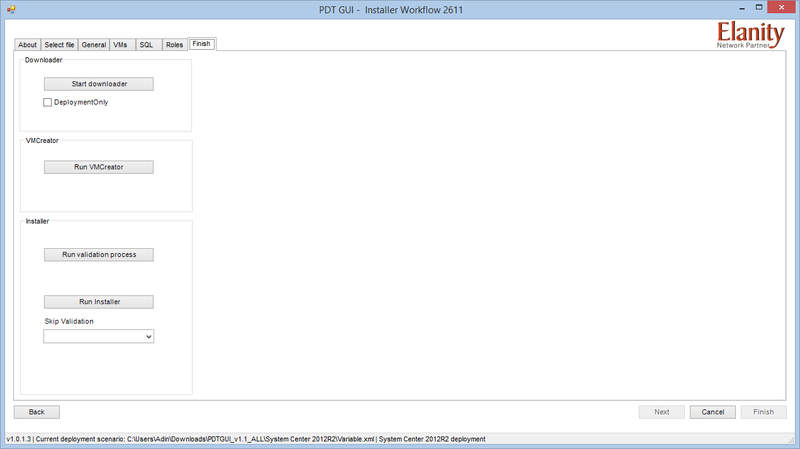 Now call the script, and include the “-ShowUI” parameter, like this: Convert-WindowsImage.ps1 -ShowUI. This will cause the GUI to appear. From this UI, choose 1). the Source (which is the ISO of your Operating System), 2). the SKU (like Standard, Enterprise, Datacenter, etc. ), 3). 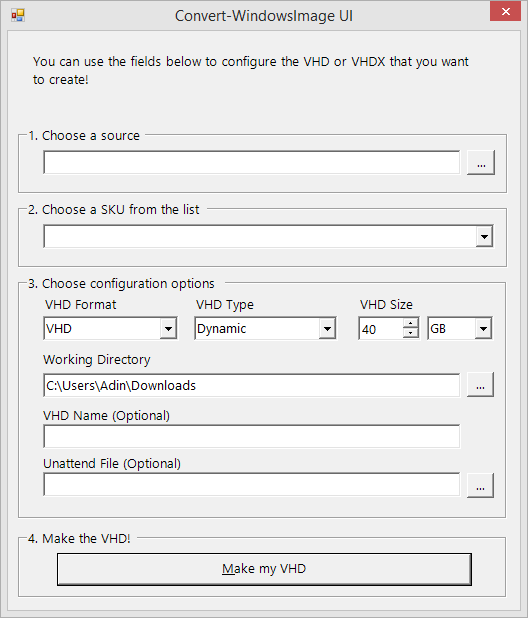 specify the file format (I choose VHDX for 2nd Generation VMs running Windows Server 2012), Dynamic, and the size (I left mine at the default of 40 GB). Leave the Working Directory as is, since that’s where the script is running from. Provide a name for the VHD file. NOTE: If you do choose to provide a name, you MUST enter the file extension or else you will encounter an error as follows (i.e. W2012R2.vhdx). When you are ready, click the Make My VHD button. 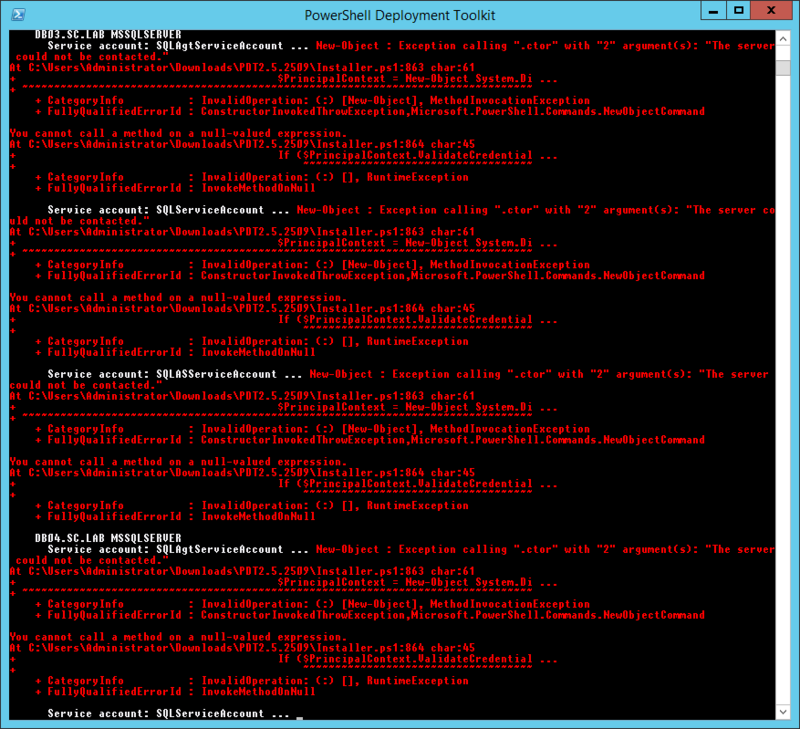 The script will show in the PowerShell command prompt what it is doing. 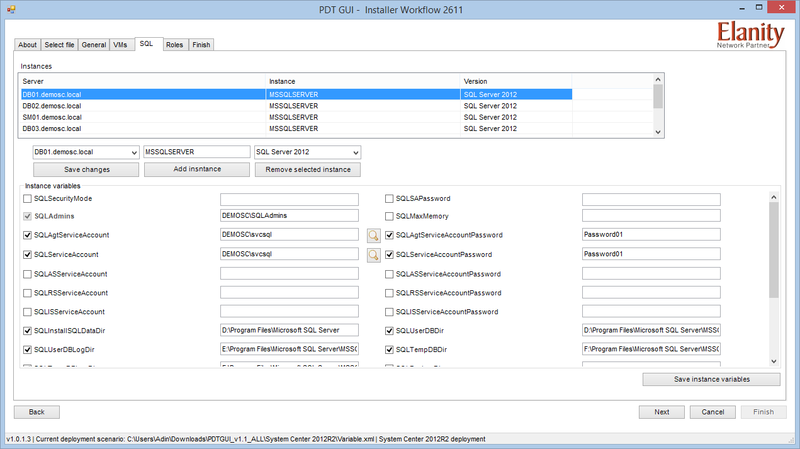 You will need to create 2 VHDs, one for Windows Server 2012 R2, and another for Windows 2008 R2. 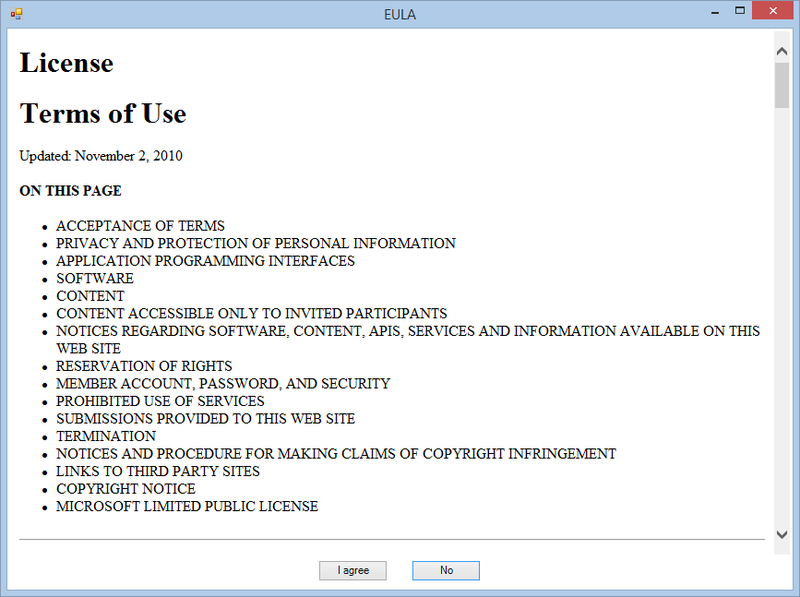 This is required because the System Center Service Manager portal runs on SharePoint 2010, which is only supported on Windows Server 2008 R2. Now that we have the sysprep’d VHD files ready, we can now use the VMCreator.ps1 script to create all the Virtual Machines (VMs) for all the System Center components automatically. By default, the VMCreator.ps1 script uses the Variable.xml file to generate the VMs. 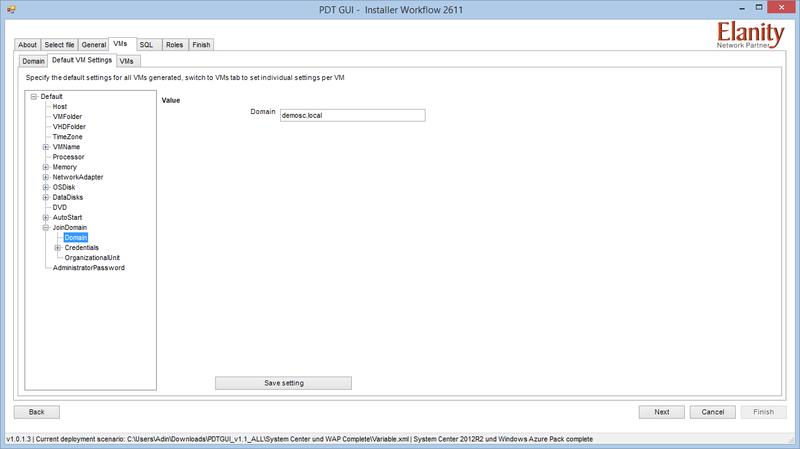 Therefore, by default it will check for the VHD file in the following location: C:\VHD\WS12R2D.vhdx. This means that you will have to either move/re-name your sysprep’d VHD file, or change the XML file to point to the correct location. In my example, I will change the XML file accordingly, as follows. At line # 235 the section begins. Within there, there is a reference to which is the sysprep’d VHD file that we created (specifically the Windows Server 2012 R2 disk). 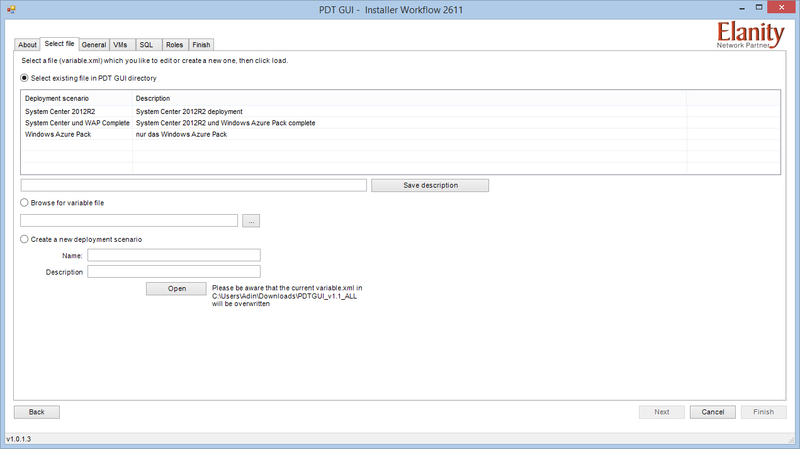 Change this entry to meet the location and name of the VHD file you created with the Convert-WindowsImage.ps1 script. At line # 399 the section begins. Within there, there is a reference to which is the sysprep’d VHD file that we created (specifically the Windows Server 2008 R2 disk). 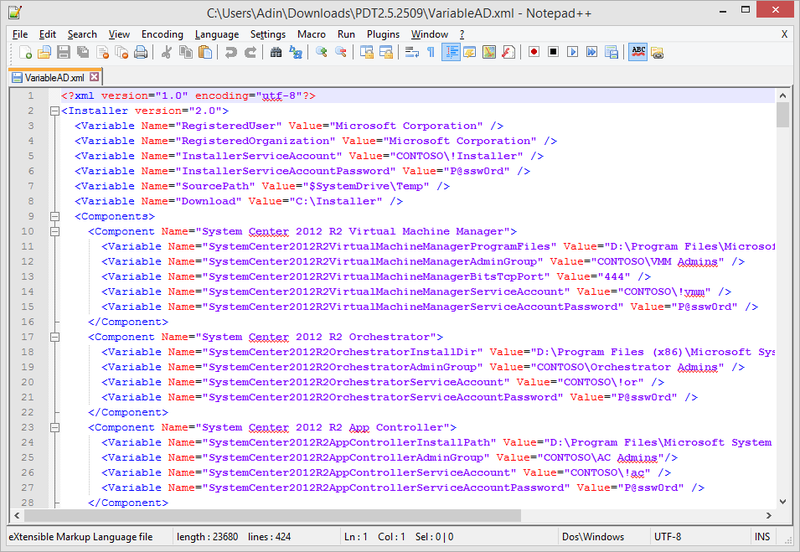 Change this entry to meet the location and name of the VHD file you created with the Convert-WindowsImage.ps1 script. 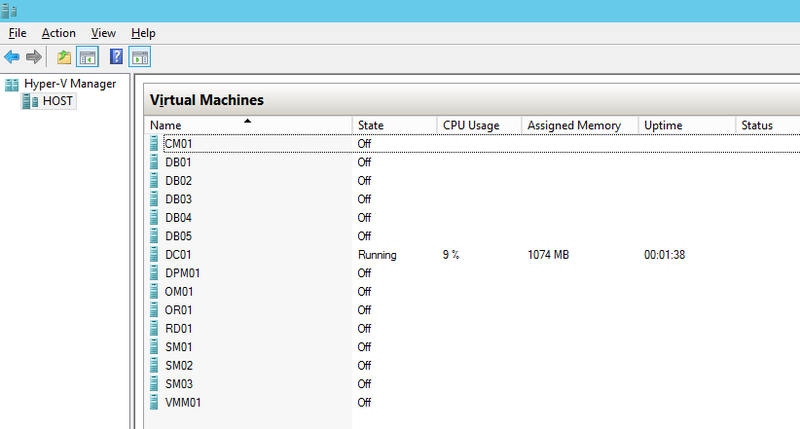 Before you run the script, you also need to ensure that the Hyper-V Virtual Switch is already created. In the Variable.xml file, at line # 222 the section begins. Change this entry to match whatever Virtual Switch you have created in Hyper-V, or create a Virtual Switch labelled the same “CorpNet01”. In my lab example, I created an Internal Virtual Switch, and labelled it “Internal Lab Virtual Switch”. One more minor note. In the Variable.xml file, at line # 208 and 209, there is a and reference. On your Hyper-V host, if you have a different drive that you want your VM files to be stored on, you need to change this reference. In my lab example, I have a dedicated SSD drive labelled as Y:\ for my VMs. 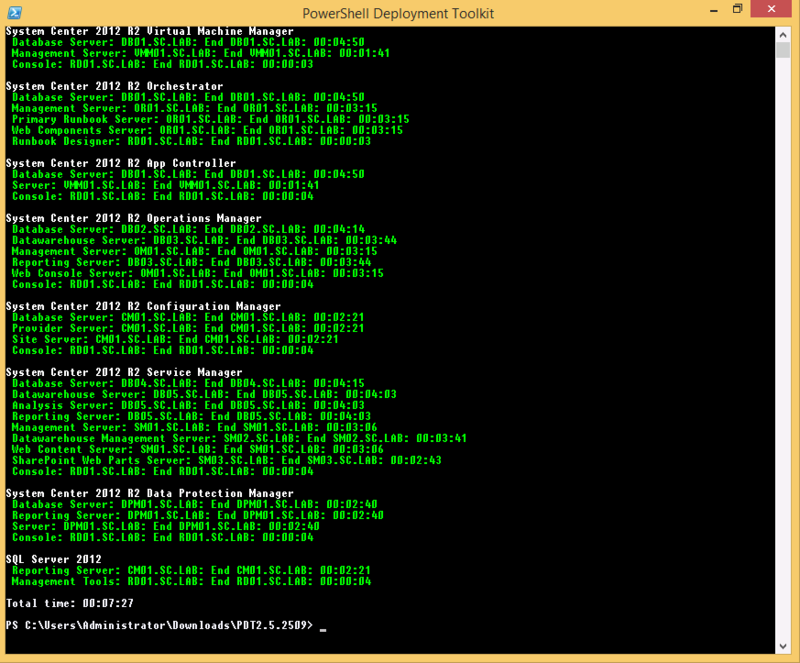 Now we are finally ready to run the VMCreator.ps1 script and watch it create all the VM’s for us! In the PowerShell command prompt, change the working directory to where the VMCreator.ps1 script is located (in my example, in the Downloads folder); for example: cd “C:\Users\Adin\Downloads”. Now run the script: VMCreator.ps1. The command line will show you its progress. First it will validate everything, and then start creating the VMs. You will notice that it first creates the Active Directory Domain Controller, and waits for that to be up and running (with Domain Services installed), and then create the other VMs. This is because all other VMs are joined to the domain. Once all the Virtual Machines are up and running the script will appear to be completed, as follows. However, if you connect to the Domain Controller, you will see that another script is running to install all the components for each System Center product. Eventually, you will notice that some lines will turn yellow. This is because some elements are dependant on others, so it needs to wait for those to complete. 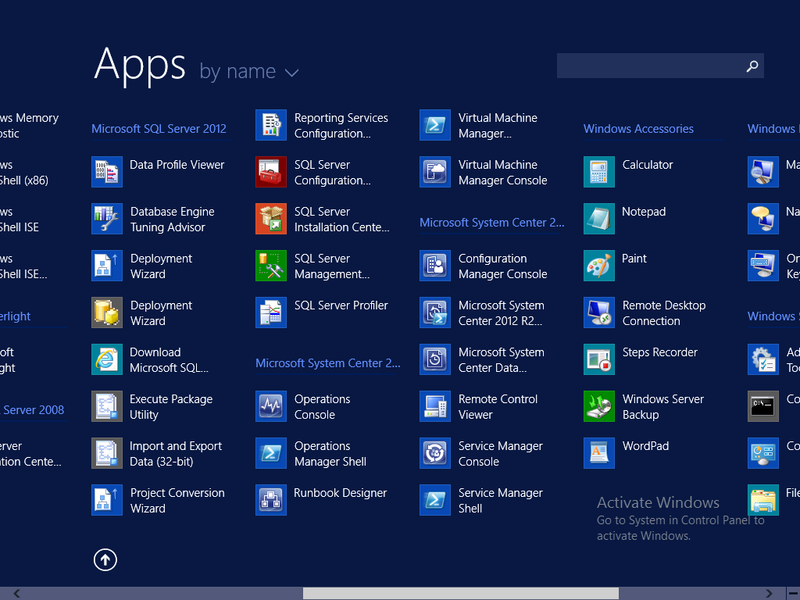 For example, SQL Server needs to be installed before Management Servers, Management Servers need to be up and running before Consoles are installed, etc. When an element is complete, the line will turn green. This entire process will take some time, and is dependant on your hardware. In Microsoft’s MMS demo, it took them just less than an hour. With my lab hardware (described here), it took approx. 1 and a half hours. In the last post in this series, we will go onto using the next script, Installer.ps1.